We've been reading lots of books lately!! Whenever we go to the library we check out about 20 or more books! Cassie can actually listen to 20 or more books in one sitting and has been able to have this attention for books the past two years! 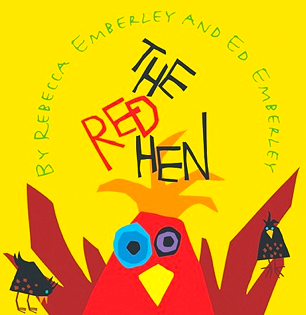 We happened to come across a great book: The Red Hen by Rebecca Emberly and Ed Emberly. The story is about Red Hen who finds a recipe for Simply Splendid Cake and she goes about asking all the animals if they will help her make this cake. None of them help so in the end she and the crows end up eating the cake. The great thing about this book is that there is a recipe for Simply Splendid Cake at the end. So we both decided to make this cake today! It wasn't difficult to convince Cassie----she jumped right in! We had all the ingredients on hand which made it easy to do on the spur of the moment! 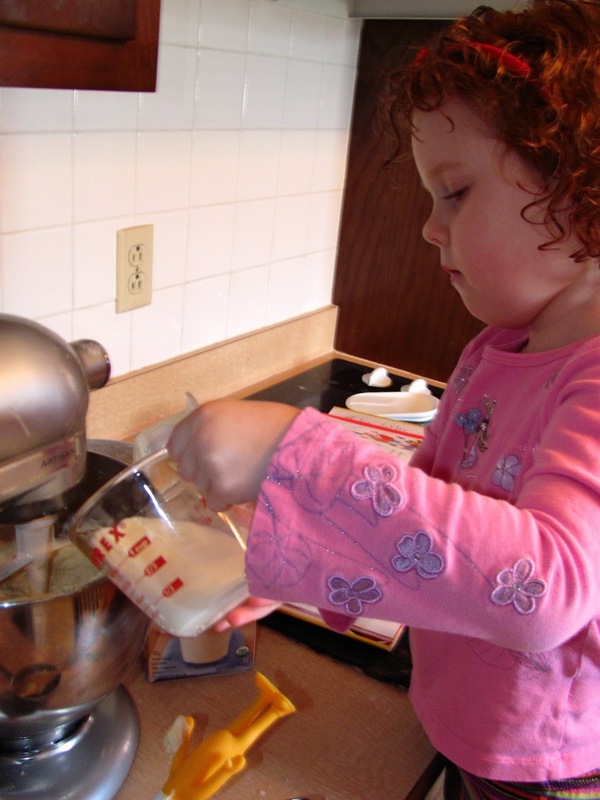 Here is Cassie helping to make the cake batter. 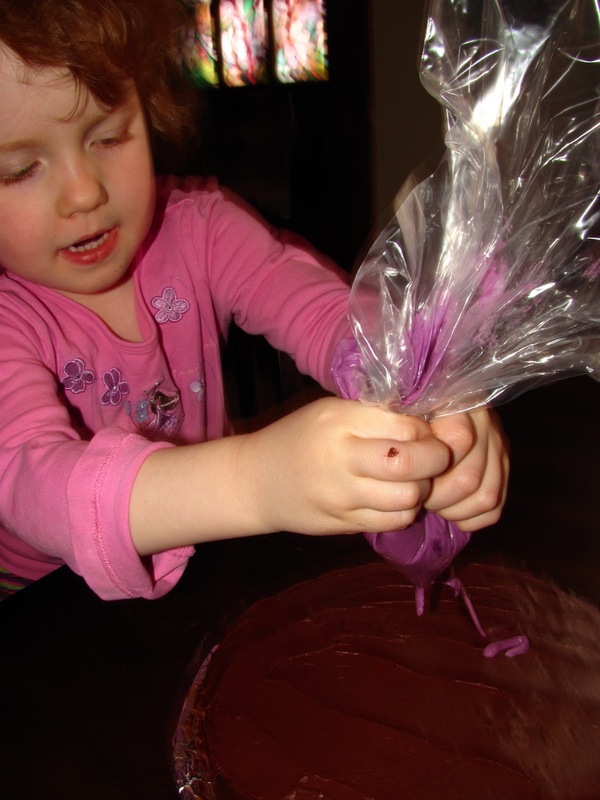 My daughter was such a great helper---too bad Red Hen did not have her as a friend to help bake her cake! The recipe in the book has a colorful picture/word recipe to follow which my daughter loved. The recipe was simple and sweet and the cake tasted wonderful. We had to wait for the cake to cook and cool. Then we were ready to frost it. I used the recipe on the back of Hershey's Cocoa for the chocolate frosting. 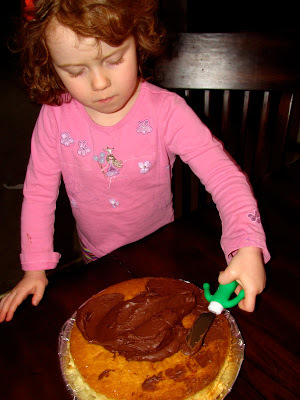 Red Hen could not get her friends to ice the cake either. Cassie was ready and willing because this girl loves frosting!!! I finished spreading the chocolate frosting and then we were ready to decorate and no one would help Red Hen with that either. Poor Red Hen!! We used the recipe for frosting from the Shamrock Cupcakes that we made. 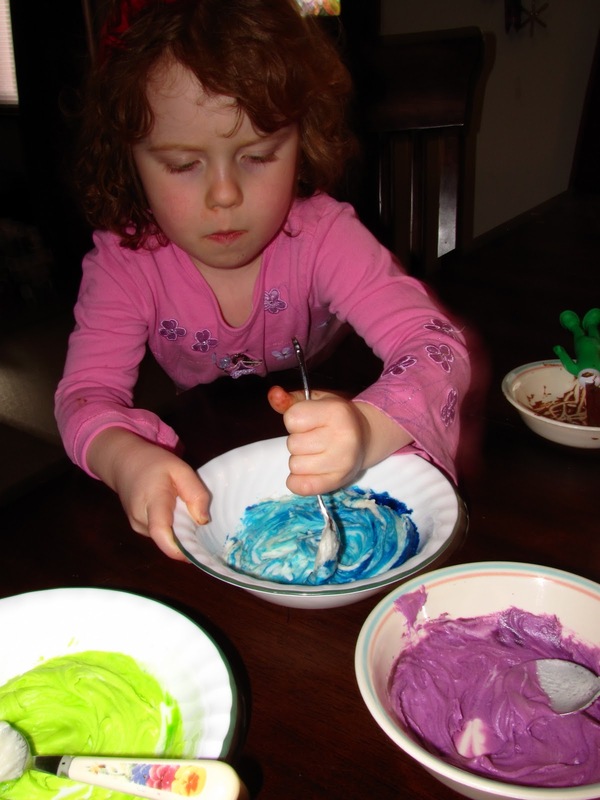 Cassie loved helping to mix the colors into the frosting. We wanted it to be "Splendid" so it couldn't just be plain chocolate! I didn't have any fancy frosting bags so we just used plastic bags with the corner cut off and that worked really well! 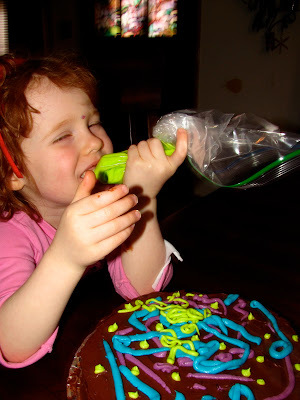 Cassie loved to decorate and Eat the frosting! My daughter really got into this and could have kept doing it for a long time!! We were on our way to a Simply Splendid Cake!! We decided to add a few sprinkles and jelly beans to make the cake more "Splendid" and I added a few pink flowers with my old frosting press from my Grandmother. Cassie wanted to add candles too, but I didn't take a picture of that part. It may look like a mess to some, but we both thought it looked beautiful and we were very excited to eat it after dinner! It was Simply Splendid!!!! 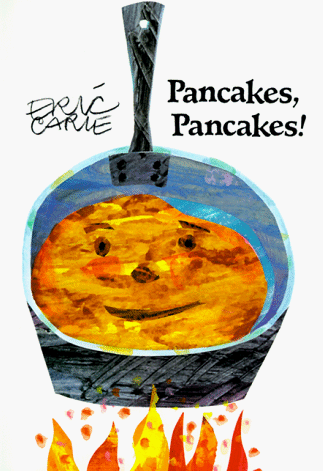 Another book we have that has a recipe to go along with it is : Pancakes, Pancakes! by Eric Carle. We've made pancakes a million times. I love these books with recipes. What fun--- and a great activity to do with a book! 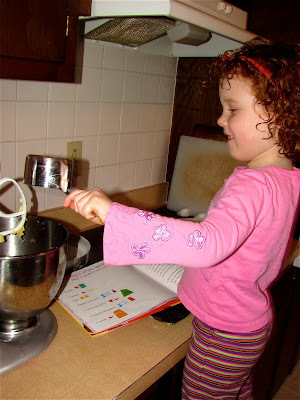 Do you know of any other picture books with recipes??? Cute! You may have a future "Cake Boss" or "Bakerella". Thanks for the book recommendation. Love that your C loves her books! So cute! Looks like Cassie had a blast decorating that cake. I bet it was good too! And thanks for the books reco!! That chocolate cake looks delicious! YUMMY!!! This is super splendid! I love the colored frosting and jellybeans! This is great. We're going to look for this on Thursday when we head to the library! Definitely gonna have to keep this in mind for my babysitting days....the kids will LOVE me!!! What a yummy looking cake! 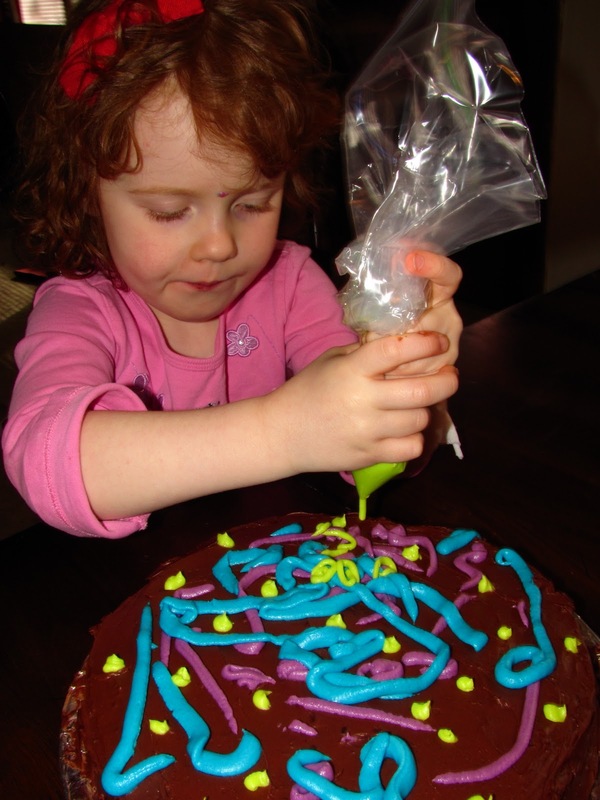 And there's so much going on here for Cassie: measuring, pouring, mixing, color blending, squeezing, and painting with frosting! Oh, and eating too. Yum! She's adorable! Your daughter is so cute! Looks like she had lots of fun. I would love it if you would stop by and link up to my party! It sure looks delicious! She looked like she really loved getting to decorate it all by her self. I also enjoy the story of The Little Red Hen, the repetition is so much fun, and children seem to understand how the little red hen feels throughout the story. How nice that there is a recipe in this one - Mmm! this cake looks very good! Lovely pictures - Cassie looks like she's having fun! The cake looks yummy-and bit on the sweet side! Oh my gosh... simply awesome. What fun!!! Sure she loved this project! Wow you've had fun this week! How about Mama Panya's Pancakes for your next book with a recipe? Thanks Lori! I will have to check that out!